Kingston has introduced its new lineup of microSD cards designed for write-intensive applications in harsh environments. 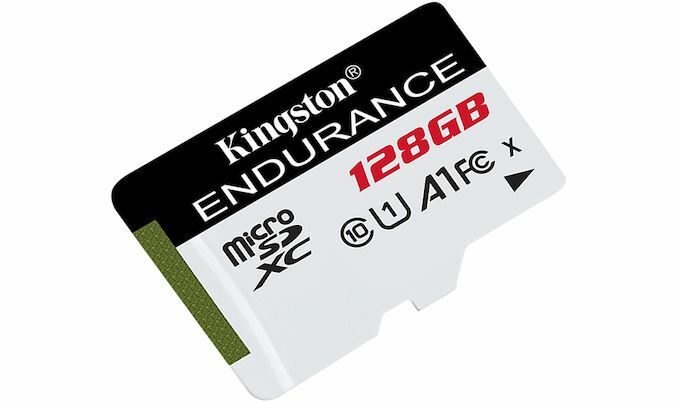 Kingston’s Endurance family microSD cards promise extensive durability, an extended operating temperature range, and protection against rough conditions. Aimed primarily at security cameras as well as dash cameras in vehicles, Kingston’s High Endurance microSD cards come in 32 GB, 64 GB, and 128 GB capacities. The 32 GB and 64 GB versions offer up to 95 MB/s sequential read speeds as well as 30 MB/s sequential write speeds. Meanwhile, the 128 GB model features a sequential write speed up to 45 MB/s. Kingston’s High Endurance microSD cards use an UHS-I interface, with the cards officially rated for UHS Speed Class 1, meaning they support a minimum write speed of 10 MB/s. In addition, the cards carry the A1 app class badge, so they should offer solid performance for running Android applications as well. Meanwhile in terms of durability, the High Endurance microSD cards from Kingston are IEC/EN 60529 IPX7 certified for protection against water submersion up to 30 minutes and depth up to one meter. And in terms of environment temperatures, the devices can withstand temps ranging from -25°C to 85°C. Furthermore, they are protected against X-ray exposure according to ISO7816-1 guidelines. Kingston’s High Endurance microSD cards are backed by a two-year warranty and will be available shortly. Samsung's high endurance cards are, on the face of it, lasting longer with longer warranties. And the pricing is excellent: the Samsung 64GB card is only $18 on Amazon. ** Samsung is rated at 1080p @ 26Mbps. No idea what Kingston's using. > Furthermore, they are protected against X-ray exposure according to ISO7816-1 guidelines.